ECREEE has been assisting ECOWAS member states in developing their SE4ALL National Action Agendas including, the National Renewable Energy Action Plan (NREAP) and the National Energy Efficiency Action Plan (NEEAP). These documents provide a national strategy and road map - validated by each government - sustained by national policies. The SE4ALL National Action Agenda translate the national policies in a strategic path that will bring each country close to the SE4ALL objectives by 2030. The next phase for ECREEE consists in supporting the Member States to develop their investment prospectus (IP) based on a bottom-up approach that consists of developing a pipeline of projects displaying the effort and timeline for bringing each identified project to maturity and bankability. 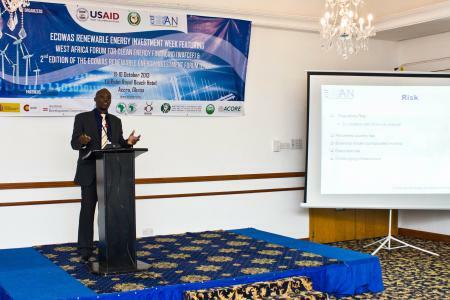 ECREEE receives support of the European Union’s Technical Assistance Facility (TAF) to assist 8 ECOWAS Member States in elaborating their investment prospectus: Nigeria, Sierra Leone, Liberia, Cabo Verde, Senegal, Togo, Benin and Cote d’Ivoire. Individual consultants with extensive and relevant experience, have been contracted by the EU TAF to support ECREEE and the member states in this assignment. The duration of the IP elaboration is 6 months; activities will be starting in July 2016. Aim to achieve the SE4ALL goals by identifying and developing a set of implementable programs and projects, including their investment requirements, which can be presented to potential private and public investors. Target Audience of Financing institutions, e.g. Development Finance Institutions (DFI), Public donors, Foundations, Private sector investors, Banks, Private equity funds. Present an integrated set of prioritized and sequenced investment opportunities. Integrate technical, financial and implementation requirements for achieving intermediate goals and outline of funding requirements for capital investments, technical assistance and capacity building. Is a Conversation starter for a variety of investment opportunities that will provide prospective financiers just enough information to decide whether or not they might want to liaise with specific project presented in the IP document. Identify energy policy frameworks or government priorities relevant to reaching the SE4All objectives and presented investment proposals. The IP is not a bankable document, but sets out country and market context and provides enough information to a financier to decide whether or not to enter into detailed due diligence. The information on IP investment opportunities will feed into virtual SE4ALL “market places” that could facilitate match-making between potential investors and investment opportunities (such as IRENA Market place). Step 1: Formation of a country team, teams formed in the Action Plan process should continue through the Investment Prospectus process. Step 2: Engagement of public + private sector stakeholders, CSOs, and donor community. Step 3: Country background information, and country Action Plan, energy sector trajectory and challenges, and nexus and other cross-sector issues. Step 4: Introduction of Investment Prospectus process to stakeholders, eligibility criteria, type of projects (e.g. 4 pipelines). Step 5: Consultation process approach, and consensus building towards projects’ identification and selection (e.g. call for proposals, sector specific workshops), development of draft Investment Prospectus, peer review process by SE4ALL quality circle. Step 6: Presentation of final draft of the Investment Prospectus.